After tooth loss, it can become a challenge to smile with confidence, speak normally or have the courage to go out to eat with friends. After tooth loss, it can become a challenge to smile with confidence, speak normally or have the courage to go out to eat with friends. Replacing one or missing teeth is achievable with dentures and dental crowns and bridges, but these methods cannot be compared to the permanence and functionality of dental implants. Only dental implants act as a strong tooth root structure to permanently replace missing teeth for as long as a lifetime. Known for their high quality strength and natural appearance, dental implants help patients of a variety of ages and backgrounds to live comfortably again in a beautiful, functional smile. Dental implants look and feel just like your natural, healthy teeth for a smile that is beautiful and strong. 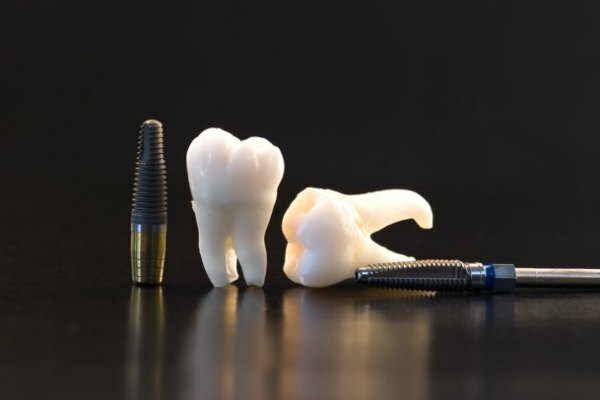 Using a small titanium post, dental implants are secured into the jawbone to act much like a strong tooth root to hold your dental crown or bridge into place. For patients who are in good general health and have lost one or more teeth due to periodontal disease, tooth decay, a dental injury or age, dental implants have become the standard option for patients seeking a permanent dental solution. Many patients do not know the effects of tooth loss on their oral health until dental issues such as TMJ pain or gum disease have occurred. It can feel embarrassing or uncomfortable to live without a full smile, but tooth loss has related health risks as well. From developing a misaligned bite when remaining teeth shift or move out of place, to causing tooth decay and infection in the mouth, tooth loss requires professional dental insight for proper assessment and treatment. As your local family dentist in Elm Grove, Dr. Meinerz has years of experience in treating patients after tooth loss and guiding them towards better oral and overall health. Dental implants require little to no change in a good oral hygiene routine, and don’t require some of the daily tasks of caring for removable dentures. Simply brush and floss regularly the way you would your own natural teeth. While dental implants are revolutionary forms of teeth replacement, they are personalized and customizable to look and feel just like your natural healthy teeth. With dental implants you may forget you ever had a missing tooth. At Honest Teeth in Elm Grove, Dr. Meinerz is dedicated to providing each patient with comfortable treatments that work to benefit their health and peace of mind. When you come in for a dental implant Dr. Meinerz will carefully assess your oral health and medical history to determine if dental implants are right for you. While this treatment is not right for everyone, Dr. Meinerz and his team will partner with you to determine the ideal dental solution for your specific needs. Give us a call at (262) 784-7770 to schedule your consultation for restorative dentistry in Elm Grove. Every patient is unique and will have varying treatment times and plans for dental implants. In addition, some patients may feel more comfortable with various options of sedation dentistry to help them feel relaxed and calm throughout the placement of the implant.To best understand what to expect about your treatment for dental implants, the staff at Honest Teeth encourage you to call (262) 784-7770 to schedule a consultation for a more functional and beautiful smile with dental implants.